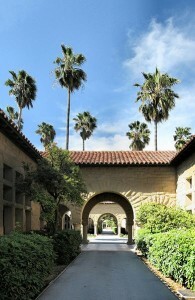 Stanford plans to expand its undergraduate population (photo credit: Jawed Karim). The number of undergraduate Stanford University students will be rising soon! Why’s that? Because the university’s president, John Hennessy, recently announced a major plan to expand the student body on campus. Why the plan? Because Stanford wants to “keep pace with the growth of the graduate student population and allow Stanford to serve more students, a proposal with broad implications for University admissions, facilities and faculty,” according to “The Stanford Daily.” There are currently 8,871 graduate students at Stanford University as compared to only 6,999 undergraduate students. Up until 1990, according to “The Stanford Daily,” the undergraduate population of Stanford had always exceeded that of its graduate population, but that all sharply changed after that. What do you think about Stanford University’s plans to expand its undergraduate student body to keep pace with its graduate student body? Do you think that this will make it easier to get in since there will be more slots? Let us know your thoughts on the expansion by posting a comment below!